Francesco Molinari was left ruing two costly errors on the back nine after squandering the chance to claim a second major title at the Masters. Relive a dramatic final round from Augusta National. The Italian began the day with a two-shot advantage and still held the same lead with seven holes to play, only to go for the flag off the par-three 12th tee and see his ball drop into Rae's Creek. Molinari pitched onto the green with his third shot and two-putted for a double-bogey to slip back into a share of the lead, which he held until he got himself into further trouble at the par-five 15th. The Open Champion's third shot clipped a tree and dropped into the hazard, with his fifth shot also narrowly missing the water, as Molinari racked up another double-bogey to fall three off the pace. Molinari was visibly emotional after making par at the next to see his hopes of winning the Green Jacket ended, as playing partner Tiger Woods fired three birdies in a four-hole stretch from the 13th on his way to claiming a historic 15th major title. 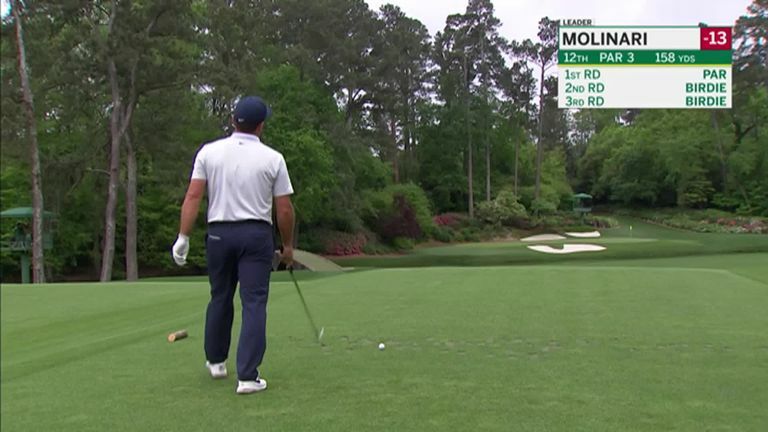 Click on the video above to see Molinari's Masters-ending errors!